UPSXDragon finally final and released. This mesh was sent to me in the end of 2013 (not long before my last working computer crashed) but the mod is finally finalized now. His project uses different sounds than the proposed MU's version before, and I guess also the projectiles are very different since these were made a new. This mesh is based on the original one, with new anims, unlike MU's mesh which was re-made from scratch(the u97dragon). I could have waited until next part of Unreal PSX done but this is worth a separate release. Yes. This is worth a separate release. Very nice work by all involved. Just ran a few tests using SwarmSpawner to add a few into a practice match and was impressed right away. May have to add these to the mix of things that spawn on my servers. Woop, woop, this is nice! Finally a Dragon in Unreal (since Firestorm is yet to be released!) The mesh is well made, the animations look fluently and the AI works pretty well (I could watch it flying up a tower killing a SkaarjSniper who attacked it earlier with no Path Nodes being added). The Dragon sounds are nice, too! However, I think the flapping/walking sound is a little bit too loud, it got on my nerves pretty quickly, unfortunately. Secondly, I would've enlarged the fire stream of the Dragon. Right now, if you stand like 5 metres away, you have no problem dodging the projectile. I'm sure it was intended to be so slow due to its immense strength (holy crap, it can kill a player with full health, if you take the full hit lol), but I didn't feel the danger as opposed to being up close. A longer fire beam or faster projectiles, but with reduced damage, could make the dragon more of a threat than it is at the moment while still making a fight fair. I'm not sure, though, if you are up to changing anything. Just my thoughts. Well, the mapper could change some stats individually, anyway. Other than that, the beast is awesome! I won't be changing the pawn as it is, as this is really intended for the UPSX project this way, but you can of course create your own using those resources. AlCapowned and his resurgence have his own branch of the dragon and he chose completely different sounds and effects. I didn't see his version but since it's supposed to be released soon also I guess you can wait for it. Looking forward to putting it to good use, thanks for the upload! Leo(T.C.K.) wrote: I won't be changing the pawn as it is, as this is really intended for the UPSX project this way, but you can of course create your own using those resources. AlCapowned and his resurgence have his own branch of the dragon and he chose completely different sounds and effects. I didn't see his version but since it's supposed to be released soon also I guess you can wait for it. Ah, I thought so, and thanks for the offer. With this release, I did think of using a dragon in my campaign actually! Though, I'm not sure if i can implement it logically. Good to know that AlCapowned would make his own version, I'm excited to see it as well if he chooses to release it. Nice . I would have liked if there would be a small video demonstrating the dragon! Doesn't seek out bots as much as I would like, but will attack them and other scriptedpawns if disturbed. It does seek out players, and will kill them nicely. I may be getting a functional computer again Thursday, so can't wait to try these new dragons to compare to the other version. EvilGrins wrote: I may be getting a functional computer again Thursday, so can't wait to try these new dragons to compare to the other version. Those ones are the MU's old ones, he only used the original skin on it but the mesh was new but inspired by the original model. At the time he made it it was because we didn't have means to export the old models yet out of beta versions etc. That changed later and alcapowned made new animations for the beast, but the original mesh is still the original and MU's one felt like it was stung by bees all over if you get what I mean. So this finally does the dragon some real justice. That's fine, though the corroded damage(slime) is only with the fang. The Red Dragon attacks with flames, while the Fang spews acid clouds. That's the real difference. The projectiles won't get stuck with this one. I can assure you that. 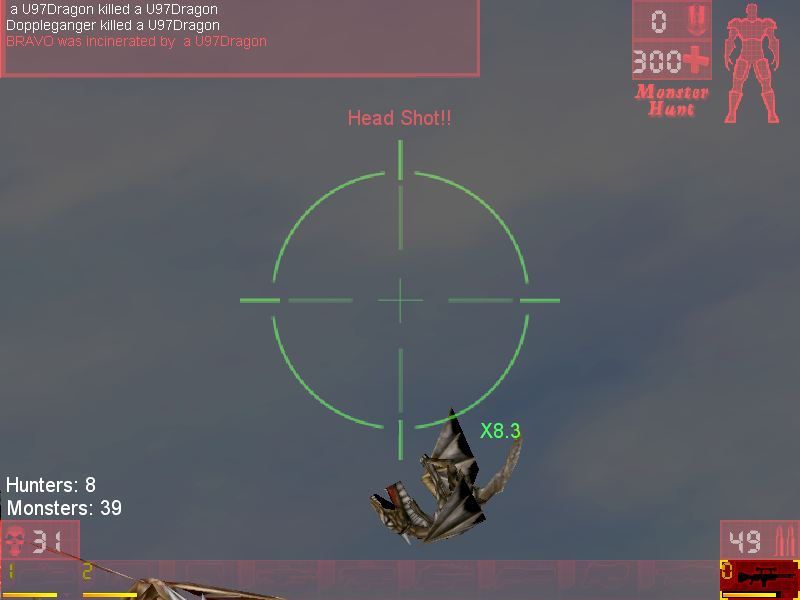 The U97dragon projectiles were made dumbproxy instead of simulatedproxy, which is a common mistake when making a new projectile class. The reason why the upsxdragon is sleeker, well it is the original model plus added animations. When Master_Unreal made the U97Dragon, he recreated the model from scratch because it wasn't avaiable to us at the time, he used the original skin but there was no way for us yet to get the original mesh. The UPSXDragon mesh was originally made by Epic, the U97Dragon one is recreation/approximation. I hope this explains the difference to you. Leo(T.C.K.) wrote: The UPSXDragon mesh was originally made by Epic, the U97Dragon one is recreation/approximation. I hope this explains the difference to you. It does but begs a question: Dragon is an original Unreal1 beastie... so got any plans to being that gargoyle and minator out as projects too?